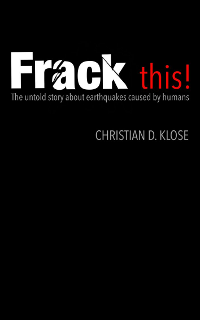 Christian D. Klose’s book Frack this! unveils the shocking facts that humans can cause earthquakes. With illustrations, charts,and tables, Dr. Klose, as a distinguished researcher, brings together leading-edge discoveries from top scientists around the world. With worrisome clarity, the author describes in simple terms and in a nontechnical language the fundamental concept of human-caused earthquakes and their root causes. He shows how everyone can lay groundwork to keep earthquake risks in perspective and how to stay safe. This groundbreaking book provides numerous examples of evidence ranging from tremors induced by the new fracking technology for producing oil and natural gas to earthquakes caused by secret nuclear underground tests that were performed in the US and the former Soviet Union since 1955. Other examples include mining earthquakes causing billions of dollars in damages and devastating earthquakes caused by the filling of artificial water reservoirs, such as the 2008 Wenchuan earthquake in China that took more 68,000 lives. Without opposing any of these technologies rather than illuminating associated risks, Frack this! provides practical, insightful, and engaging knowledge for everyone who is affected by or wants to know more about earthquakes caused by humans. 2010 T. Dahm, S. Hainzl, D. Becker, M. Bischoff, S. Cesca, B. Dost, R. Fritschen, D. Kühn, S. Lasocki, Klose, C.D., Th. Meier, M. Ohrnberger, E. Rivalta, S. Shapiro, U. Wegler, How to discriminate induced, triggered and natural seismicity?, In: Induced Seismicity, European Center for Geodynamics and Seismology, Workshopon November 15-17, 2010. Webersik, C. and Klose, C.D. (2010), Another Easter Island? Climate change, human insecurity and politics in Haiti and the Dominican Republic. Climate Change and Security, 250th Anniversary Conference, Royal Norwegian Society of Sciences and Letters, June 21-24 2010, Trondheim, Norway. Klose, C.D. and C. Webersik (2009), Assessing The Inter-Relationship Between Geohazards, Sustainable Development, And Political Stability: A Comparative Study For Haiti And The Dominican Republic. 7th International Science Conference on Human Dimensions of Global Environmental Change, Bonn (Germany), 26th-30th April 2009 (accepted as Lecture).